2142 West El Segundo Blvd. KGB Deals posted a $7 for $14 deal for Oh My Burger in Gardena, and I was unable to resist the siren's call of low price and an unknown burger in a part of LA to which I had never ventured. I grabbed Happy Meal and we buzzed down the 405 and the 105 to seek out Oh My Burger. When we arrived, it did not seem like the sort of place well-established enough to be utilizing local deal sites. It was a typical LA burger shack. There were three folding tables inside and a handful of partially covered tables outside. 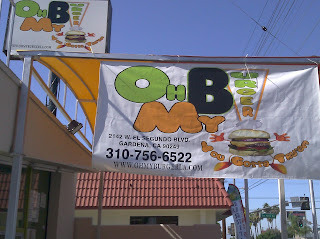 I came to learn that Oh My Burger was also getting great word-of-mouth referrals from around the neighborhood. 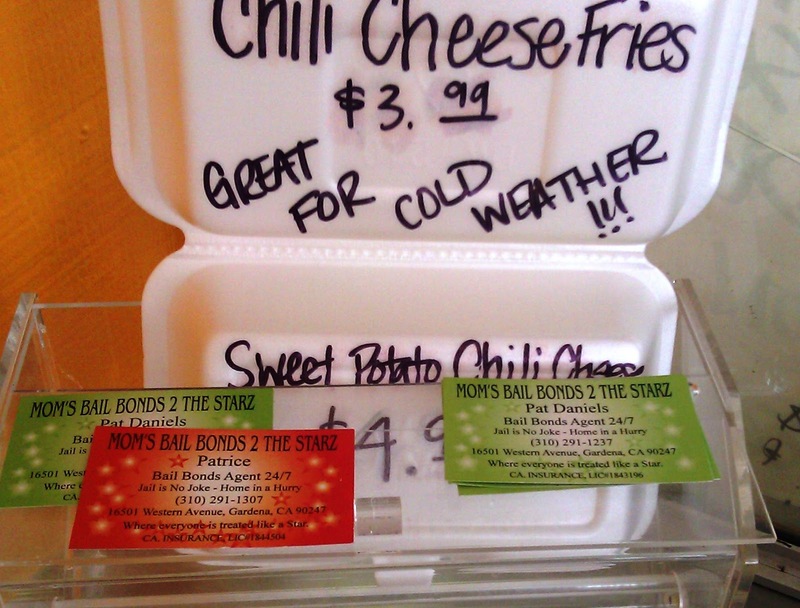 One of my favorite decor touches was the stack of bail bondsman cards beside the advertisement for chili cheese fries. Oh My Burger had only been open for 6 weeks when we visited. I learned that, and a host of other facts about the place, by eavesdropping on the conversations between the proprietor and her various customers. The location had already been host to a number of restaurant ventures, each of which had sputtered out in rapid succession. The last one made it 6 months. Oh My Burger was the first go at a restaurant by the young woman, 24, that owned it and ran the kitchen. One of the more adventurous burgers on the menu was the Big Luther, which was a bacon cheeseburger served on a Krispy Kreme donut bun. We kept it simple and ordered a couple of basic Fresh Burgers with Cheddar. I ordered fried pickles, and Happy Meal went with fries. After about 15 minutes our orders were ready at the window. 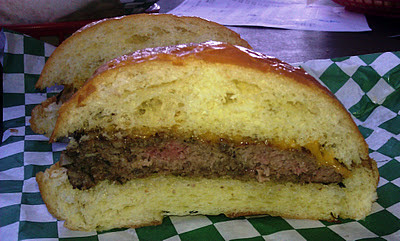 The Beef: The burgers at Oh My Burger were mild Chuck, but the Chuck was blended with bits of fresh onion. The burger was about 6 ounces. The fat content was in the 20% range. I found the beef over-manipulated to the point where it was a little chewy. The onion flavor dominated, and the burger had a very homey taste like when your mother would try to jazz up a burger with onion soup mix. I am not a fan of onion in my burger, so I was not a fan of the flavor of this burger. Still, it seemed to cater to local tastes. The Sear: The thin patties were well-seared around the edges. Unfortunately, the dry bun and the lack of seasoning robbed the sear of any style points. The Preparation: I assumed that the beef arrived pre-ground (medium). 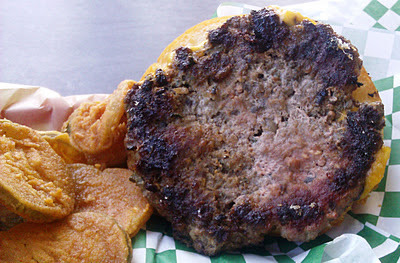 It was blended with chopped onion and formed into firm, thin patties. The burgers were cooked on a properly hot gas griddle/flat top. My burger came out an odd sort of Med-Well. There were little blotches of pink interspersed throughout the patty. The Cheese: The Cheddar at Oh My Burger was likely a Tillamook, but it didn't matter. The dry bun crushed the cheese and destroyed any contribution that it might have made. The Bun: The Brioche bun was stale and crumbly. It was likely 2 days past its prime. The young owners definitely cut corners here, and that was unfortunate. The high-domed bun was also oiled, and I could have done without that. The Fries: Under-cooked and mealy but nicely seasoned. I discovered, by listening in, that they were working their way through the last of the frozen, crinkle cut fries so that they could transition over to house-cut fries. It was clear that she knew she was serving an inferior product, but she didn't want to throw out product, which she had already purchased. I found that a little insulting, since I was within earshot and eating the very fries, which she was discussing/disparaging. Later, while doing additional research, I noted that the owner, Danielle H., had commented on Yelp that the fries were hand-cut and par-cooked, in the past. This led me to conclude that Oh My Burger had tried the frozen crinkle cut fries, discovered that they were not as good as the previous fries, and continued to serve them just to get rid of them. This was most disappointing. The Deep-Fried Pickles: These were fine. They were tart and crunchy. The Sides: The veg looked fine on other burgers, but I came to Oh My Burger for a cheeseburger, not a salad. The Value: I paid $7 for the coupon and an additional $4.99, so this would have been a $19 meal. It was not worth $19. It was nearly worth the $12, which I actually paid. Oh My Burger had a long way to go when I visited. The quality and prep were in need of much fine-tuning. I hoped that the young owners didn't go broke learning the lessons required to earn repeat business. 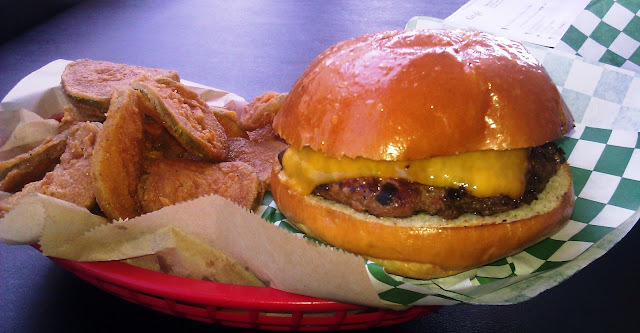 Burger Review : A home-style burger, which may improve as the staff gains experience. This place is amazing, go give them another test, and they'll prove you wrong. Anyway, I love the So Fresh! The meat, I've sat and watch them prepare, handmake, season, weigh and individually wrap the meat patties. I like the buns you can ask for the others if you wish. My burger was cooked medium well without asking, I don't mind. The fries were fresh cut potatoes, and awesome with garlic Parmesan. 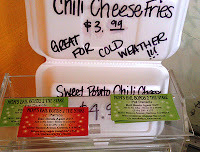 OMB fries as they call them. They also have turkey burgers which are hard to find. Vegetables are a big part of the menu, just read their mission statement and it will describe why. I've been here 3 times, and I have no problems. staff is nice, and the place has personality.